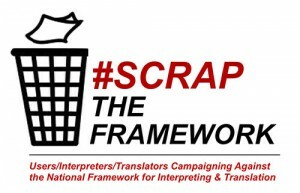 What is the #ScraptheFramework Campaign? The National Union of British Sign Language Interpreters (NUBSLI), a branch of Unite, launched the campaign in February 2015. The campaign is a response to the national framework for interpreting and translation services which users, interpreters and translators oppose. Awarded to: Clarion, The Language Shop, Sign Solutions, Language Empire, thebigword, Prestige Network, DA Languages. This is a Pan Government Collaborative Framework Agreement for use by UK public sector bodies, which includes Central Government Departments and their Arm’s Length Bodies and Agencies, Non Departmental Public Bodies, NHS Bodies and Local Authorities. Contracts cover health and corporate services including IT, Legal, Estates & Facilities and Business Services. You can read our open letter that was sent to France Maude concerning the CCS Framework Agreement. extend for two further periods of 1 year each and further year which can be exercised). Bedfordshire, Cambridgeshire, Essex, Hertfordshire, Norfolk and Suffolk. Commences: Anticipated 1st November 2016. Ends: 31st October 2020 (with the option to extend for a further 2 x 12 months). NUBSLI wish to make it clear that BSL/English Interpreters are not prepared to jeopardise the sustainability of their profession by accepting the diminished fees, and terms and conditions set out in these frameworks. These are not fitting for a workforce of extensively trained and qualified freelancers, and clearly go against market rates falling short of the industry standard.Government are regrettably overlooking the counsel of the profession. We have already seen the boycott of one NHS contract by interpreters in the South West. Interpreters are increasingly prepared to take a similar position with other contracts which do not meet our basic rates of pay and terms. We will be continuing to campaign against these frameworks and will work with individual commissioners wherever possible. We have also seen one agency – Pearl Linguistics – go into liquidation. Find out who your MP is at Write to them and contact them directly to express your concerns. If you are a trainee/qualified interpreter or translator, join us. Being part of a union can strengthen and protect our profession.